·It took us three days to get there, when it should have taken one. This was due to road closures and delayed flights. We also had delays on the way home, causing us to arrive at our final airport at nearly 3am. And, we still had a four hour drive home that morning. ·The only tour we booked, on the last day of our trip, was canceled 40 minutes before we were supposed to go on it. · Although we activated travel status, our credit card was not working. ·The food at our resort made my husband very ill. As a result, he spent the bulk of the time in Mexico in our room, including New Year’s Eve, and his birthday. ·We had tequila trouble. (This ordeal was so frustrating and comical that I will do a separate post on it). Honestly, we didn’t love the resort we stayed at, but at least they offered some fun things. While my hubby was sick, I went on a guided bicycle tour of the area. On the tour, we stopped at a “mini”zoo and saw a variety of animals. We also were able to swing by and observed the dolphins and sea lions at Dolphin Encounter, and we ventured over to the other side of the marina. It was nice to get to see some of the surrounding area. 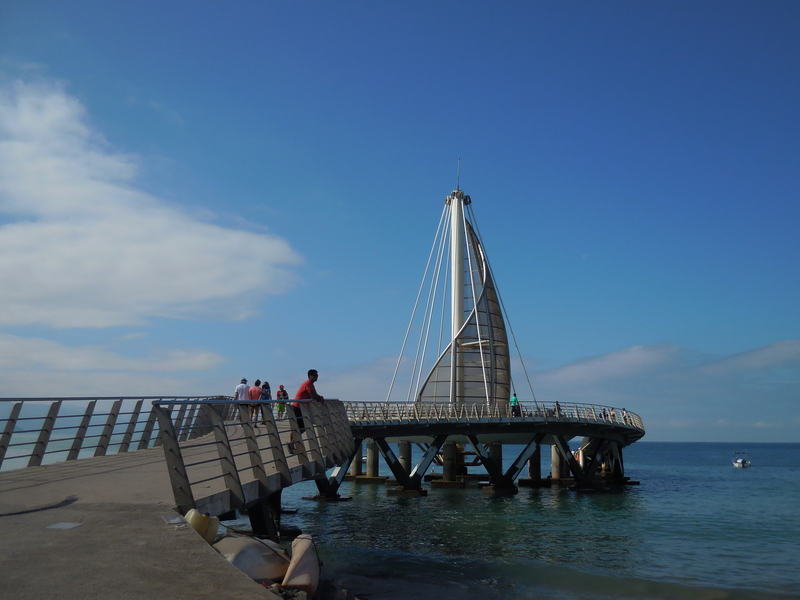 One day we went strolling along the Malecon. This boardwalk was filled with energy and amazing art). I was impressed not only by the amazing sculptures that dot the boardwalk, but by the displays of sand sculptures too. Because of the tequila situation I mentioned earlier, we also stopped in nearly every tequila store along the way, and I tried many samples. I was a happy girl! We also made a pit stop at the Cheeky Monkey for $1 margaritas and Senor Frogs for their yummy lunch and drinks. We made our way to the Lady of Guadalupe church, which was beautiful inside and out. On top of this church, sits The Crown of our Lady, which is a very symbolic sculpture. Among several other things, it contains 24 gems which represent the hours of the day and palms representing the founding of Puerto Vallarta in 1851. On our final night, we were able to watch a professional dance group perform traditional Mexican folklore dances. These dancers were so talented and they were really fun to watch. Luckily, we had miles and miles of beachfront near our hotel, so we also walked on the beach, worked on our tans, did a little kayaking, took photos, and caught up on reading. The water in Nuevo Vallarta was pretty murky, so we didn’t spend a ton of time in the water itself. We were able to go Flyboarding early in the trip before everything else started to go south. If you want to read more about that, check out my flyboarding post here. It was so much fun! All-in-all, a trip is what you make of it and we tried to make the best out of this trip, even though it didn’t always work out, especially when it involved tequila.